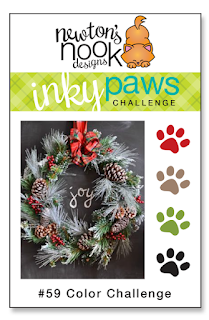 Create a project using the colors: Holly red, pine cone tan, fir green, and black. You have TWO WEEKS to play along - Deadline to enter is Friday, November 17, 2017 at Midnight CST. The winner and DT favorites will be announced on the NND blog the following Monday. Are you ready to play along and get your paws inky? Zsofia Molnar's chalkboard with the bold sentiment from Sentiments of the Season stamp set paired with the red and white striped background paper is just striking. Then her sweet Newton from Newton's Holiday Mischief stamp and die set adds the purr-fect touch for this festive holiday card! 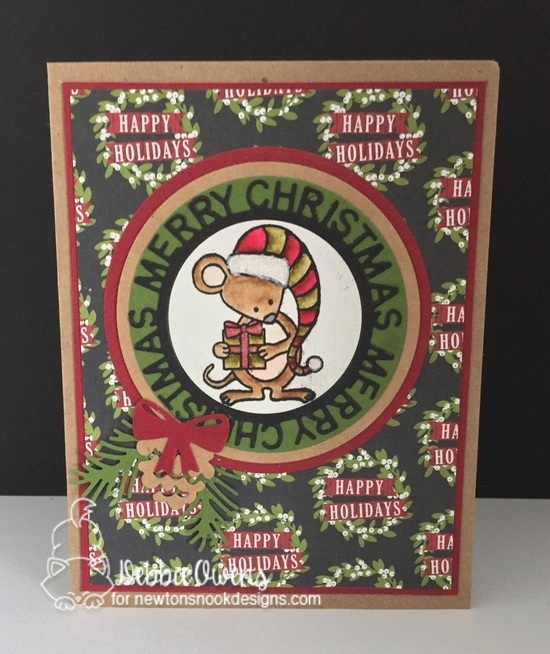 Debbie Owens features the new Naughty or Mice stamp set! I love the circular layers with the festive background paper. The added pines, pinecone and bow were die cut with Pines & Holly Die Set t and provide a nice finishing touch! Emily Lauritzen creates a stunning wreath using the Pines & Holly Die Set. 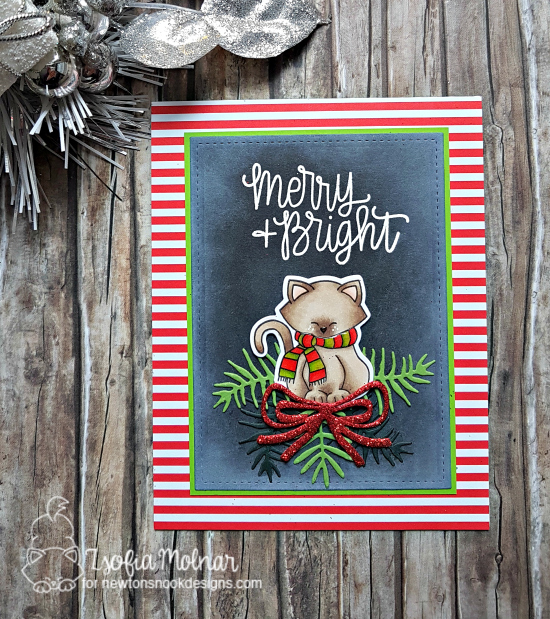 The chalkboard background with the embossed sentiment from Sentiments of the Season stamp set and the wonderfully colored Newton from Santa Paws Newton stamp and die set complete her stunning card! 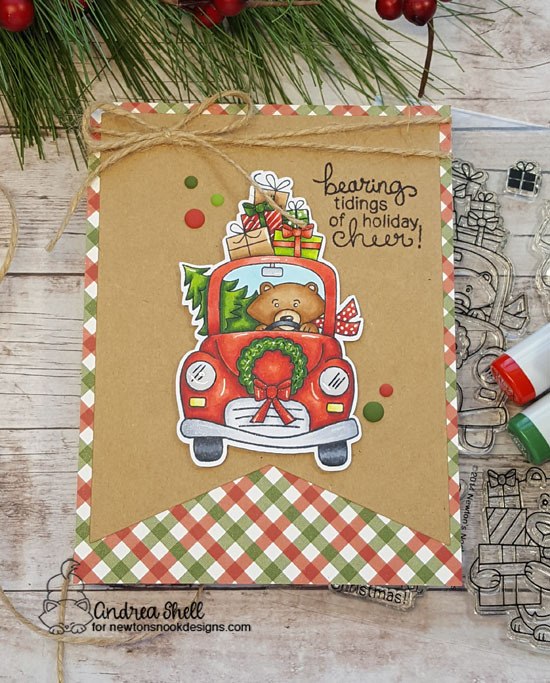 Andrea Shell showcases Winston from Winston's Home for Christmas stamp set. I adore how she uses the fun, plaid paper as well as her amazing coloring skills! The twine adds a nice final touch! 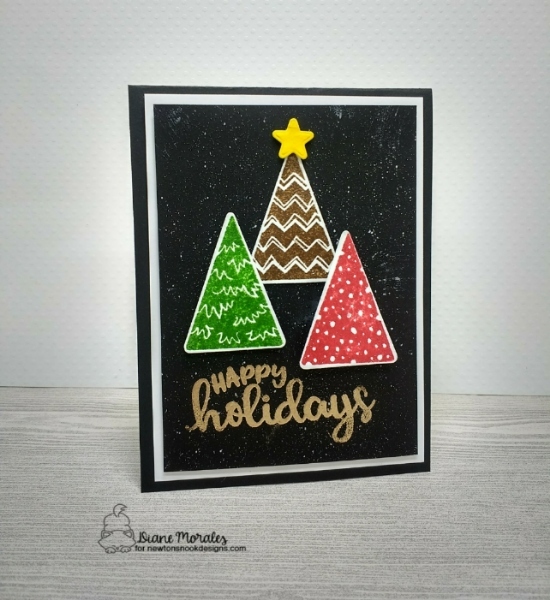 Diane Morales brings us an amazing trio of Christmas trees using Festive Forest stamp and die set. She adds a bold sentiment from Seasons of Sentiments to complete her elegant holiday card! Awesome awesome designs by the design team! I LOVE these colors! Beautiful inspiration from everyone! Thanks for another fun challenge and wonderful inspiration.